Language reflects culture, which is perhaps why Merriam-Webster put out a call late last month to defeat “fascism.” The dictionary was trying to avoid having to name the term—which was experiencing a “what is the EU”-style resurgence in the wake of Donald Trump’s victory on November 8—as its word of the year, an award that’s bestowed based on the number of lookups for a particular word. 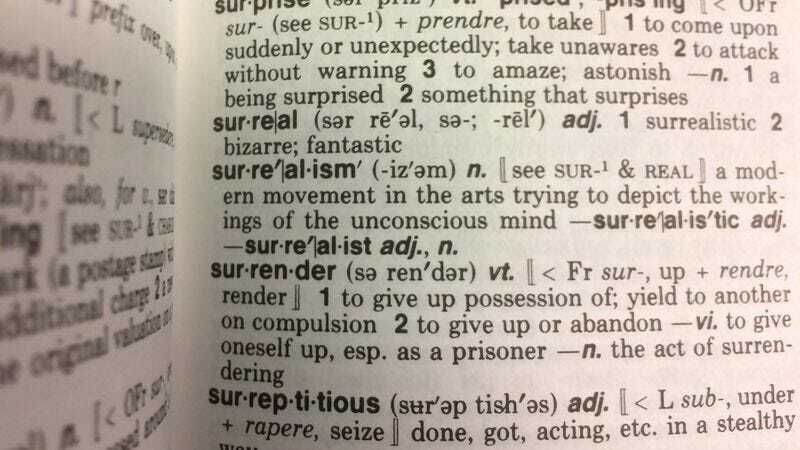 In the end, though, Merriam-Webster ended up naming another, also politically relevant word, “surreal,” as its Word of the Year for 2016. Speaking with The A.V. Club, Merriam-Webster lexicographer Kory Stamper says of the decision, “though we did ask people to rescue us from ‘fascism,’ that call didn’t really have much of an impact on the Word of the Year.” The dictionary’s alternate lookup suggestion, “flummadiddle,” did see a spike in lookups after the call, as did the user suggestion of “puppy.” But in the end, neither turned out to be statistically significant. And when the final numbers were tallied, “surreal” (adj., “marked by the intense irrational reality of a dream; also unbelievable, fantastic”) emerged as a dark horse (n., “a usually little known contender (as a racehorse) that makes an unexpectedly good showing”), and eventually the winner. So there you go: The combined forces of Colin Farrell and golf are more powerful than fascism. For the time being, anyway.